Low bridge over the Castleside road providing access to the slag heaps. Smoke plumes being carried on a brisk south-westerly wind to produce yet more fumigation effects over the town of Consett. Berry Edge Road leading west to Beech Grove and the 17th century Consett Hall. Enormous slag heaps which dominated views of the area for over 100 years. Main road (A692) connecting Castleside on A68 with Leadgate. The Grove, built in late 1920s to the west of the iron and steelworks. since the mighty Steel Works of Consett closed its memory lives and lives. The Derwent Iron Company started with two blast furnaces in 1840 and rapidly extended its operations over the next half century. 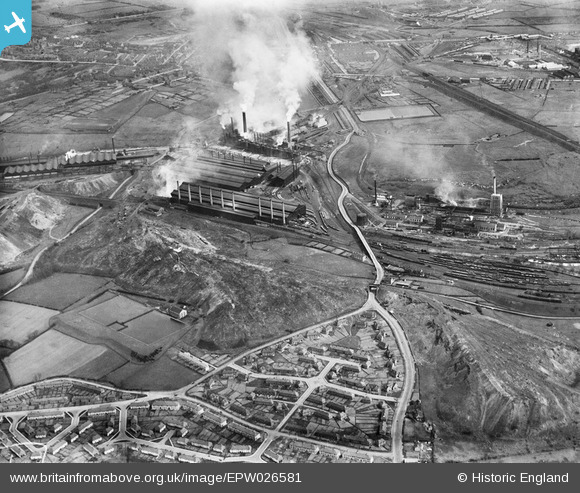 With the growth of the iron works, coke ovens and local collieries, the population expanded from 146 in 1831 to over 9,000 in 1901, and the majority of families relied on the extensive works for their livelihood. By 1893 the Consett Iron Company owned ten collieries, seven blast furnaces, steel melting shops, plate and angle mills,a foundry, brickworks and engineering works. Following nationalisation in postwar Britain, the company became part of the British Steel Corporation, employing 7,250 as late as 1970. 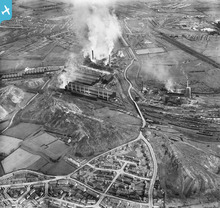 However, the isolated geographical location of Consett finally told against it and the steelworks closed in 1980. Today, massive reclamation and landscaping schemes have removed almost all traces of the former 650 acre iron and steelworks. Consett has reverted to its former rural setting, within a cleaner, less-polluted environment. The main town was laid out to the north-east of the works and when the prevailing westerly wind blew, Consett was covered in brick-red dust. If the wind was an easterly, then the air was filled with black coal dust!